This is part 1 of a little Ansible Hello World example, an IT automation tool. 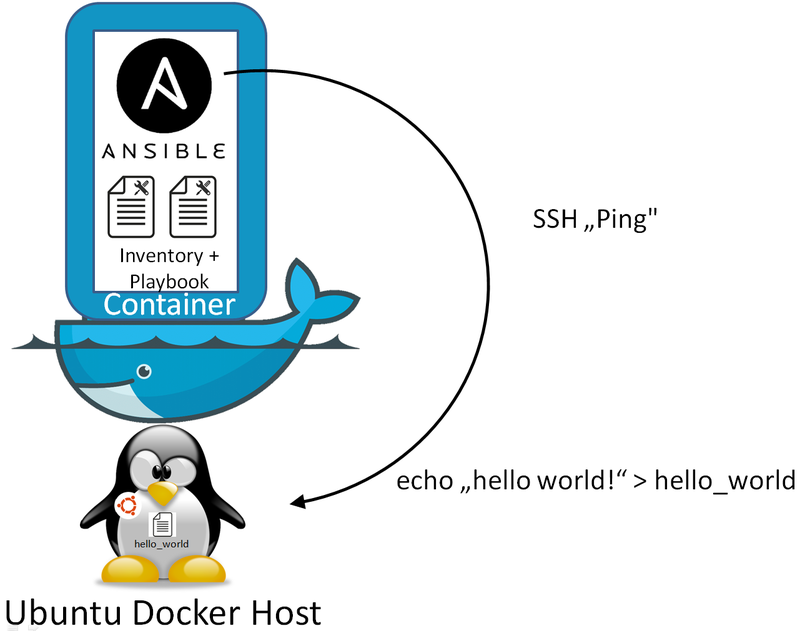 As a convenient and quick way of Ansible installation on Windows (or Mac), we are choosing a Docker Ansible image on a Vagrant Ubuntu Docker Host that has won a java performance competition against CoreOS and boot2docker (see this blog post). Try it out: Ansible Hello World on Katacoda! Get a feeling for Ansible in a real console without the need to install anything! Part 1: Ansible Hello World (this post) with a comparison of Ansible vs. Salt vs. Chef vs. Puppet and a hello world example with focus on Playbooks (i.e. tasks), Inventories (i.e. groups of targets) and remote shell script execution. Part 2: Ansible Templating Hello World focuses on templating; we will create and upload template files based on jinja2. 2016-06-08: I have added command line prompts basesystem#, dockerhost# and container#, so the reader can see more easily, on which layer the command is issued. For the “hello world” tests, I have chosen Ansible. Ansible is a relatively new member of a larger family of IT automation tools. This InfoWorld article from 2013 compares four popular members, namely Puppet, Chef, Ansible and Salt. Here you and here find more recent comparisons, if not as comprehensive as the InfoWorld article. 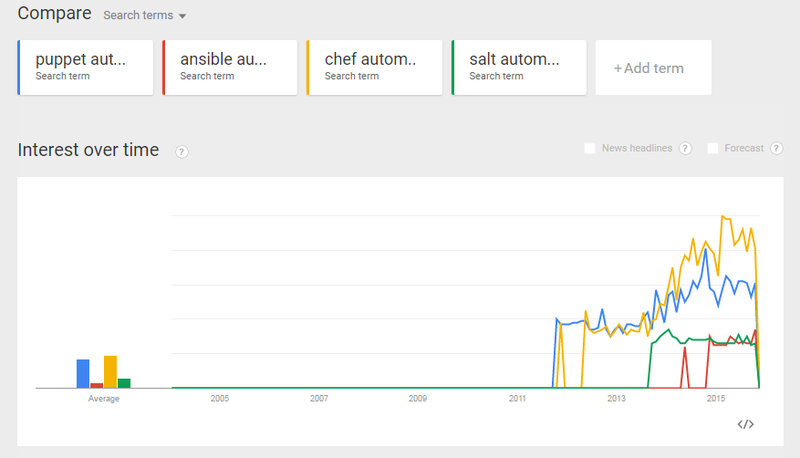 Okay, in the google trends analysis we can see that Ansible is relatively new and that it does not seem to replace Puppet, Chef or Salt. However, Ansible offers a fully maintained, RESTful API on the Ansible Web application called Ansible Tower (which comes at a cost, though). Moreover, I have seen another article stating that Ansible is very popular among docker developers. Since I have learned to love docker (it was no love at first sight), let us dig into Ansible, even though Puppet and Chef seem to be more popular in google searches. For a discussion of REST and Web UI capabilities of the four tools, see Appendix D.
Are you new to Docker? Then you might want to read this blog post. I recommend having direct access to the Internet: via Firewall, but without HTTP proxy. However, if you cannot get rid of your HTTP proxy, read Appendix B. Administration rights on your computer. Note: I have experienced problems with the vi editor when running vagrant ssh in a Windows terminal. In case of Windows, consider to follow Appendix C and to use putty instead. This command will lead to an error if you work behind an HTTP proxy since we have not (yet) configured the docker host for usage behind an HTTP proxy. I recommend getting direct Internet access without HTTP proxy for now. However, if you cannot get rid of your HTTP proxy, read Appendix B. Now let us test the remote access to a Linux system. Ansible is agent-less, but we still need to prepare the target system: Ansible’s default remote access method is to use SSH with public key authentication. The best way is to create an RSA key pair on the Ansible machine (if not already available) and to add the corresponding public key as “authorized key” on the target system. container# ssh vagrant@192.168.33.10 -C "echo hello world"
This should echo a “hello world” to your screen. Here 192.168.33.10 is a reachable IP address of the docker host (issue ifconfig on the docker host to check the IP address in your case). For troubleshooting, you can call ssh with the -vvv option. container# ansible all -i '192.168.33.10,' -u vagrant -m shell -a "echo hello world\! > hello_world"
This was your first remote shell action via Ansible. Now we want to have a look at playbooks, which are the Ansible way to document and automate the tasks. Note: If you have problems with the formatting of the characters in the terminal (I have experienced problems in a Windows terminal), then I recommend to use a putty terminal instead of using vagrant ssh. For that, see Appendix C.
We see that the file hello_world was overwritten (“Hello World!” with capital letters instead of “hello world!”). Instead of specifying singular hosts in the playbook.yml, Ansible offers the more elegant way to work with groups of machines. Those are defined in the inventory file. More information about inventory files can be found in the official documentation. However, note that this page describes new 2.0 features that do not work on the Docker image (currently ansible 1.9.4). See Appendix E for more details on the problem and for information on how to upgrade to the latest development build. The features tested in this blog post work on ansible 1.9.4, though; so you do not need to upgrade now. In order to see the difference, we also have changed the hello world to all capital letters. Here, we have replaced the list of hosts by a reference to the inventory file. We see that the file hello_world was overwritten again (all capital letters). Success! We have shown, how you can download and run Ansible as a Docker container on any machine (Windows in my case). 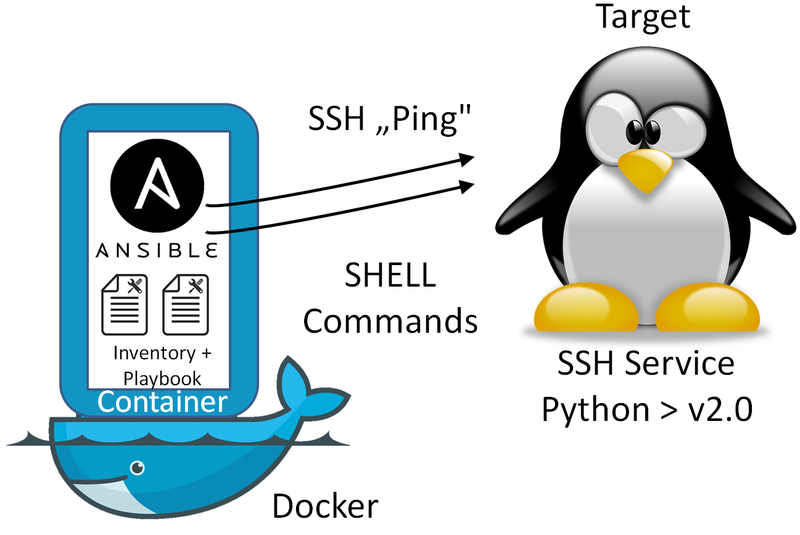 We have prepared the Ansible container and the target for SSH connections and have shown, how to perform connectivity tests and shell scripts on the remote system. In addition, we have introduced Playbooks as a means to document and run several tasks by one command. Moreover, Inventory files were introduced in order to manage groups of target machines. the physical host for both, your browser as well as your terminal session (http_proxy and https_proxy variables) for successful vagrant init commands and download of the vagrant boxes. the docker host (if it differs from the physical host) for both, in the docker configuration files as well as on the bash. Note that the configuration files differ between CoreOS, boot2docker, and Ubuntu. the docker client for the terminal session; needed for apt-get update+install. locate and convert the vagrant private key to .ppk format using puTTYgen. start puTTYgen -> Conversions -> import -> select the above path. Press Open and accept the RSA fingerprint -> you should be able to log in without a password prompt. If there is still a password prompt, there is something wrong with the private key. a REST server API with a nice and comprehensive browseable API via the Web UI called “Ansible Tower“. The Web UI called “Ansible Tower” is an enterprise-grade tool and it is not free of charge. REST client requests from Ansible to other REST services are sent via a core module called “uri”. REST APIs for querying the database, but its scope is not yet clear to me: it seems to allow inventory management and reporting, but no ad-hoc provisioning functions. There are several Web UIs, some of them free and open source. Puppet’s REST client capability is unclear to me: I have only found a forum request about it, but the answer has either not been given or is not easy to locate. a REST Server API independent of the Web UI. The open source UI of Chef is deprecated and its proprietary replacement not available yet. REST client requests from Chef to other REST services are sent via http_request module. a REST server API in three flavors (cherrypy, tornado, and wsgi), all part of the netapi module. It allows for ad hoc provisioning (e.g. POST /run). The Ansible version in the docker image has the problem that it has a version 1.9.4 (currently), but the Ansible documentation is describing the latest v2.0 features. E.g. in version 1.9.4, variables in the inventory file described in the documentation are ignored (see e.g. the example “jumper ansible_port=5555 ansible_host=192.168.1.50″) and this leads to a “Could not resolve hostname” error; see also this StackOverflow post). 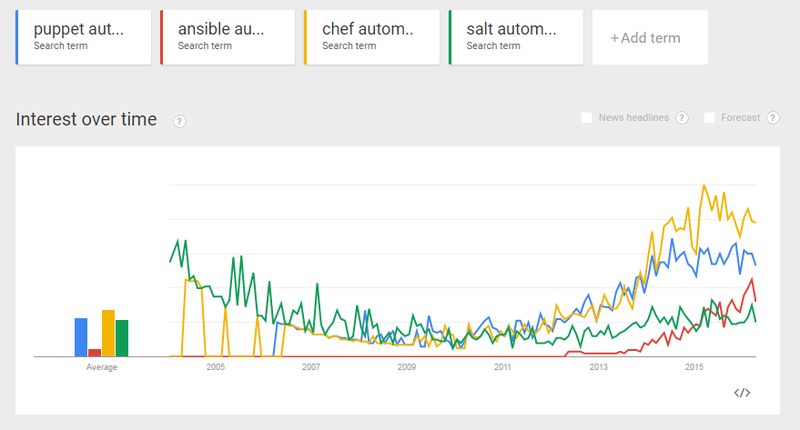 Especially the analysis of Salt’s and Chef’s popularity for 2011 and before does not look very convincing. Also, this data does not look reliable: according to Wikipedia’s Vagrant page, Vagrant’s initial version was March 2010. Why do we see so many search hits before that time? That is not plausible. The same with Puppet, which has started 2005 and has many hits in 2004. To be honest, google trends analysis used to (at least) look reliable in November 2015, but it does not look reliable anymore. What a pity: I used to work a lot with google trends in the past for finding out, which technology is trending, but looking at the more recent results, I have lost the confidence that I can rely on the data. If you know an alternative to google trends, please add a comment to this blog post. 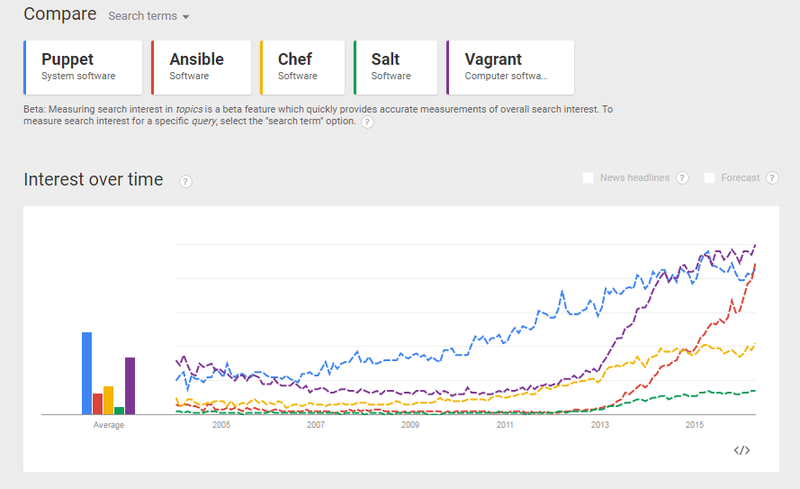 In any case; for the time after 2013, it looks like the popularity of Ansible is rising quickly (if we believe it).